The Child & Youth Health Network is using a Collective Impact as an approach to improve outcomes for young people throughout Southern Vancouver Island. 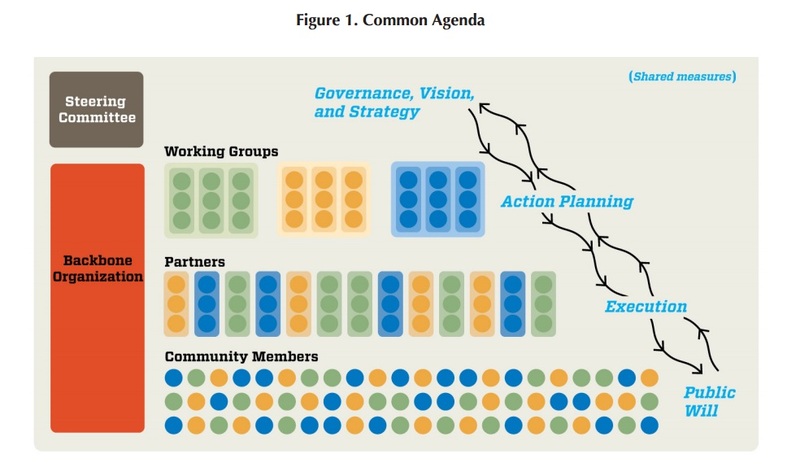 Collective Impact is a complexity-theory based approach that engages cross-sectorial partners for system change. Collective Impact enables stakeholders to use existing resources to improve the health and sustainability of their communities by: 1) convening around a common agenda that is supported by locally-generated data; and 2) redesigning initiatives to ensure mutually reinforcing activities. Due to its effectiveness, Collective Impact is being taken up by communities across North America and around the globe, as a way for diverse stakeholders to address some of our most complex 21st-century challenges. The following are resources on the Collective Impact model. The London Child & Youth Network is a child & youth focused Collective Impact initiative in London, Ontario. The United States has a network of ‘cradle to career’ initiatives called Strive Together. The original Collective Impact paper, with links to other papers published by the Stanford Social Innovation review. A recent, comprehensive text resource is ‘Collective Insights on Collective Impact’ from the Stanford Social Innovation Review is comprised of 9 short articles and includes some of the most recent thinking about Collective Impact. Investigate the Collective Impact Forum. Investigate an interactive theory of action for ‘cradle to career’ initiatives using Collective Impact. A podcast from Tamarack Institute for Community Engagement with Paul Born and John Kania. Also includes a text summary of Collective Impact and links to additional resources. From the Collective Impact Forum archive, practitioners answer the question “Why Collective Impact?” in this short video. Also from the Collective Impact Forum, a 2-minute introductory ‘motion graphic’ Tackling Complex Social Problems through Collective Impact.